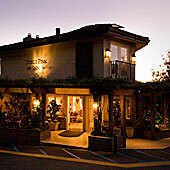 The Tickle Pink Inn****, Carmel-by-the-Sea, California, USA . - GourmetVoyageurs.com high end food and travel e-magazine. 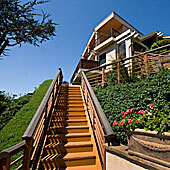 "Breathtaking views" are the way to best describe the Tickle Pink Inn in the Carmel Highland of Carmel, California. A delightful inn, was created by and named after Bess Tickle, wife of the California State Senator, Edward Tickle. They named their own stone house "Tickle Pink", so while the original structure no longer stands, the name remains for this beautiful property with its charmingly homey rooms all with a view. While the original house no longer exists, the last remaining little cottage on the property does still stand and is equipped with two bedrooms and just further down the hill from the main buildings is now called "Senator's Cottage" and is part of today's complex. Mrs. Tickle loved the flowers, especially pink ones and today the grounds abound with flowers and lush plantings. 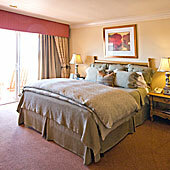 The rooms are charming and the soft color palette of emerald, soft sage, rose and beige are romantic and soothing. The beds are very comfortable with Italian crafted Egyptian cotton linens, plush terry robes and a freshly ground coffee service available in all the rooms and suites. Located a few steps down the hill from the main rooms in a secluded and cozy setting are the hot tub and Gazebo, perfect for sipping a glass of wine and relaxing. "The Senator's Cottage" is cut into the cliff side, nestled amongst the pine trees and flowering beds with its own private patio. The two bedroom house with kitchenette, living and dining room and wood burning fireplace is perfect for two couples on a romantic getaway. The bath also houses an oversized jacuzzi but and large walk in shower. The suites are spacious and all equipped with balconies that run the whole length, all with views out over the sea. The rooms are comfortable and beautifully equipped. Each also has its own private balcony and all have sea views. Some have fireplaces. The sun sets straight out over the Pacific, so make sure to schedule your dinner not to conflict with the fabulous sunsets. A glass of Champagne, some nibbles and a gorgeous sunset can't be beat! Then let the sound of the surf lull you to sleep and feel the stress melt away. Choose from 35 rooms and suites as well as the "Senator's Cottage." While the hotel does not have a restaurant, an expanded continental buffet breakfast featuring a selection of breads, muffins and pastries, Eggs Florentine, ham, a selection of freshly squeezed juices, gourmet fresh ground coffee, herbal tea, dry cereal, a variety of fresh fruit and more — all from Tickle Pink’s kitchen is included and can be enjoyed in their small downstairs lounge or, weather permitting, out on the desk with its view out over the sea protected from sea breezes by a glass screen. It is served daily from 7:30 to 10 a.m.
Then each evening enjoy a complimentary reception in the Terrace Lounge 4:30 to 6 p.m. daily, featuring Monterey County wines and an assortment of cheeses, breads and fruits. Settle in near the crackling wood-burning fireplace, challenge yourself with a leisurely game of chess, or chat with other guests or just stare out to sea, unwind and let the soothing music carry you away.